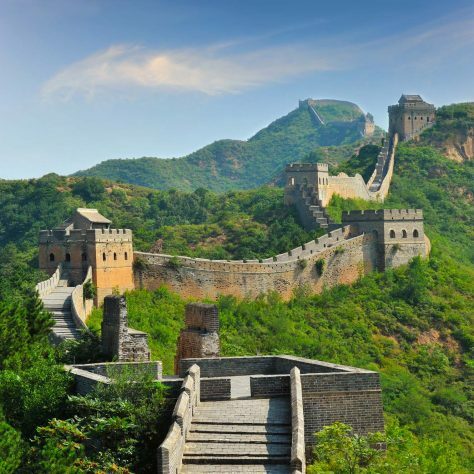 The Great Wall of China took 2000 years to build and is 13,171 miles if you include all its branches. It would take 18 months to walk it. While we like a challenge, we thought our trek should cover a taster of the best bits taking in stretches of the restored wall, as well as ancient sections in quieter locations, to give a balanced experience of its history and culture. Travelling and staying in mountain villages and hotels along the way from Huangyaguan to Juyongguan the trekking will be demanding but worth every step. The ascents and descents are steep as the wall follows the mountain contours. Our rewards will panoramic views over the hilly Chinese countryside, a mixture of rocky ridges, terraced farmland, dense forest and open rolling hills. Highlights include the dramatic Heaven’s Ladder and visiting East Quing Tombs, the final resting place of 20 emperors and empresses. The wall is in stark contrast to the frenetic pace of Beijing, where we have time to explore the Forbidden City and Tiananmen Square. You can stay on for another 4 days to delve further into Chinese culture, visiting Xian, home to the world-famous Terracotta Warriors, the Great Mosque, and the ancient wonders of the Silk Road. Whatever you choose, it’s a once-in-a-lifetime trip. We arrive in Beijing and are transferred to our hotel in the city. Relax and freshen up after the flight, or go and explore the city. In the evening you will receive a comprehensive brief from your 360 leader about the adventure that awaits. Drive approx 4 hrs; trek approx 2 – 3 hrs. This morning we leave the teeming streets of Beijing and head into the hills to the northwest, beyond the provincial town of Huangyaguan nestled in the Yanshan Mountains. On the way we will stop at the East Qing Tombs, a vast mausoleum contain the tombs of 5 emperors and 15 empresses and many other senior royals across two dynasties. We reach the village after a beautiful 4 hour drive through the hills and are given our first glimpse of the Great Wall, as it meanders over peaks and ridges as far as the eye can see in each direction. This section has been extensively restored, in contrast to other sections we will experience. We take a traditional lunch to fuel us for the start of our trek. The initial sections are steep, easing off as we head downhill towards Huangyaguan, our stop for the day. We overnight in a mountain hotel. Trek approx 7 hrs We begin our day with a tough but rewarding climb up the Heaven’s Ladder – a steep ascent of 200 steps to reach the ridge above Huangyaguan. The views from the top are as breathtaking as the ascent. Once we’ve had a bit of a rest at the top, we continue along the wall as it undulates through the forest. We then join up with the old wall, walking less restored paths with fewer people on them until we finally drop down to a small mountain village where we are welcomed by the villagers for a traditional meal before bedding down for the night in the farmhouses. for dinner and bed. Overnight in the farm houses. Trek approx 4 – 5 hours; drive approx 3-4 hrs Thanking our hosts, we climb back up through the terracing and scree to the rough path that tracks below the unrestored wall. We follow ridgelines, enjoying incredible views out over the hills for the day, before picking up farmers’ tracks that wind through the trees down to the valley through fields of crops and orchards. We wander along the rural road before finally meeting our transport on the main road. We enjoy a dramatic 3 hour drive through the mountains to Jinshanlin, and our mountain hotel for the night. Trek approx 7 – 8 hrs We begin today’s trek just outside the small village of Gubeiko, a short bus ride away. We stroll through the village and its farmland until we reach the wall. This section, whilst not actually restored, is remarkably well preserved, being one of the most recent sections built during the Qing dynasty. Some of the sections are steep and the paths rough, at one point we have to leave the wall to detour around a military outpost, before joining up once more onto restored wall that leads us down to the pastoral village of Jinshanlin. We spend the night at a mountain hotel. Trek approx 6 – 7 hrs; drive approx 2 hrs We head back to the point where we left the wall last night and continue along the mostly restored section of wall. A long flight of stone flagged steps takes us back up the mountain, interspersed with the odd unrestored section when we drop onto paths or pick our way over eroded stones. Once we reach the ridge, the unfolding panorama is spectacular as the wall snakes into the distance in each direction, watchtowers perilously standing guard at regular intervals on the peaks. Rolling hills and escarpments fill every vista. After a stunning day of trekking, we finally drop back down off the wall, following the track through farmsteads and woodland to the road head where our transport awaits to take us to Mutianyu and our mountain hotel for the night. Trek approx 4 – 5 hrs. We wander through the village, climbing back up towards the Wall. The climb takes a couple of hours back up through the woods and fields, rewarding our climb once more with striking views of the neverending wall criss-crossing the hills and mountains. This section has been extensively restored, flagged with elegant inclines and sections of steps. Finally we drop back down to the village at Mutianyu to explore the markets for souvenirs before returning to our hotel for the night. Drive approx 2-3 hrs; trek approx 4 hrs We have a bit of a drive in the morning to take us to our final section of wall at Juyongguan. Once again, this part is also well restored, with sweeping steps following the hilly terrain, and one of the steepest sections since the start of the trek. After around four strenuous hours of steep climb and descent, we reach the end of our expedition, delighted with our efforts and achievements. We climb, tired but satisfied, into the bus for the journey back into Beijing. The frenetic bustle of the city will contrast sharply with the tranquility of the hills that we have enjoyed over the last week. 21 million people living cheek by jowl, vying for space in the city, in comparison to the quiet villages we have walked through. We have some time to put our feet up at our hotel, shower, and get ready to head out for a sumptuous celebration of our efforts at a nearby restaurant. Today you are welcome to join us on a guided tour of the Forbidden City – the world famous dynastic imperial palace completed in 1402, and Tianenmen Square. Spend the afternoon exploring more of the city, do a spot of shopping or just relax in the squares. Dry stuff sacks or plastic bags. Pack some fresh clothing into bags to keep them dry in the event of a total downpour that seeps into your kitbag. Good for quarantining old socks. Either a silk or cotton sleeping bag liner can be used for extra comfort and warmth in the evenings. Consider a light polartec pair for potential bad weather and evenings. Like the jacket, an essential piece of kit to stay dry and should also be Goretex or breathable. An alternative to trekking trousers if you prefer walking in shorts. Please note that often the trails become overgrown and wearing shorts may cause you to be scratched by foliage. Waterproof walking boots with good ankle support. It is vital that you have worn these in prior to the trip. Light trekking socks are perfect for this trip as you are not going to altitude or being exposed to freezing temperatures. Keeping your feet healthy for the duration of the trek is vital so ensure you have enough changes and that they fit you well within your boots. What is the food like in the hotels top and tailing the trekking? The food in Beijing before and after the trek is generally made up of traditional Chinese food, usually presented in a buffet style. You will be able to help yourself to as much as you like and you are encouraged to try as many different things as possible. The meals are very varied with lots of different meat and fresh vegetarian dishes available, steamed rice, noodles and soup. If you are ever unsure about what is on offer, there are always hotel staff, as well as your expedition leader and local crew, available to answer your questions. What is the food like out on the expedition? Breakfast will usually consist of fried eggs, bread, pancakes, porridge and fruit and will be served along with tea and coffee. Due to the remoteness of the trek, each morning you will prepare a packed lunch which you will carry on the trek with you. Your packed lunch will typically include a sandwich, fruit and a piece of cake. Evening meals are enjoyed in the traditional Chinese style of communal dishes shared around a circular table. There will be 8-10 different hot dishes (meat and vegetarian), steamed rice and soup. At the end of the meal there will usually be some form of pudding or fruit to finish things off. With such a wide variety of dishes prepared, there is always something for everyone and often more than a table full of people can manage. Absolutely, please inform the office of any allergies or intolerance’s and we will ensure that these are taken into account on the trek. Where does the drinking water come from and is there ample? Bottled water is provided each morning for you to fill your hydration systems or drink bottles before you set off on the trek. Your expedition leader will advise you on how much water to carry and when you will be able to refill. Safe drinking water will always be available at the accommodation each evening and throughout the trek. What is the accommodation like in Beijing? The accommodation in Beijing will be in twin rooms, all with en-suites in a modern, 4-star hotel. You can expect all of the usual mod-cons of 4 star accommodation you would find in Europe. The accommodation is 3 – 4 stars. Does this represent the same western standard? 3-4 star accommodation in China is very similar to that of Europe. Naturally there are big differences in culture so you’ll notice differences in the amenities available but in terms of comfort and cleanliness, there is little difference. What is the accommodation like when out on the trek? On the trek, the accommodation will vary from basic 2/3 star hotels to a home stay in a local farmhouse. Where possible in the hotels, rooms will be based on two sharing with en-suite facilities. Rooms are clean and comfortable but by no means luxurious. They are the perfect place to get a good night’s rest after a long day of trekking. Your night in the local farmhouse is much more rustic and you will get to see and appreciate life in this rural part of China. Rooms will sleep 4-6 people with shared bathroom facilities. Do I need to bring a sleeping bag or liner? All of the accommodation will provide adequate bedding so there is no need for a sleeping bag. However, you may prefer to have your own sleeping bag liner for extra comfort or if you particularly feel the cold. What are the toilet facilities like when out on the trek? The trekking on this trip takes us off of the beaten track and there are no public toilets so it will be necessary to find somewhere appropriate off the trail. In most of the hotels you will find western style toilets but you will also come across squat toilets in many places which are very typical to this part of the world. Will there be flushing toilets and hot water for showers? There are flushing toilets and hot water available at the accommodation each evening. 360 Expeditions have conducted detailed risk assessments and put the necessary plans in place to cope with any accidents or illness whilst out on the trek. Our expedition leaders are highly qualified and experienced mountain leaders who hold expedition first aid qualifications and are used to working in remote environments. Their training, coupled with the experience and knowledge of our local Chinese crew, allow them to deal with any situation quickly and safely. Should someone find themselves requiring further medical attention, the leader will organise for that individual to be taken from the trail and transferred to the nearest hospital. The leader and the 360 office team will also be on hand to offer guidance and support for insurance claims and contacting next-of-kin. What vaccinations do you think are vital – do you need yellow fever/ rabies etc? We would insist that you have had a tetanus injection within the last 10 years and our general advice is to be vaccinated against hepatitis A, typhoid and polio. You should always consult your GP for the most up-to-date travel health information. You will only need a yellow fever vaccination certificate if you are coming from an infected area. What happens to my kit while I am trekking – does it get transported to the rest place in advanced? Each morning, your kit bag will be loaded onto a vehicle and transported to the next accommodation. All you will need to carry is a small day sack with your essential items for the day. What weight should this main bag be? Your main luggage should be packed into either a rucksack or a soft expedition style holdall and the total weight should be no more than 20kg. What should I carry with me in my day sack? Your day sack should contain only the essential items you will need for a day of trekking and your aim should be to keep it as light as possible. The items you should be carrying include; a warm layer, waterproof jacket and trousers, your packed lunch and snacks, water, camera, sun cream, personal medication and first aid kit. It is important that this bag has an adjustable waist belt to transfer the weight of your daily load onto your hips and from here onto your legs (your strongest muscles) to do most of the carrying. Can I leave clean clothes at the hotel when I arrive so they are there on my return? As we will be returning to the same hotel in Beijing after the trek is complete, you are welcome to leave a bag there with items you will not need whilst trekking. This bag will be locked securely in the hotel and you can collect it upon your return. A down jacket is not essential but a good thick fleece or jumper will be needed for the evenings. There is an extension to see and experience the terracotta army. Is this something you feel is really worth the extra time and money? The extension trip to visit the Terracotta Warriors is a fantastic opportunity to really maximise your experience in China and make the most of the long haul journey you have already made. Seeing the Terracotta Warriors is an awe-inspiring experience that gives a real insight into the sheer size and power of the ancient Chinese dynasties. You will learn even more about ancient Chinese cultures and traditions and get a better understanding of how these magnificent dynasties developed. In addition to the Terracotta Warriors, you’ll get to take an overnight train through beautiful countryside to the amazing ancient city of Xian where you’ll have time to explore the city walls, markets and traditional restaurants. When is the best time to travel on the GWC? The best time to trek on the Great Wall of China is September to October and April to May. How cold can it get in the day and in the night? The trek takes us into the beautiful mountains north of Beijing and like any mountainous environments, weather and temperature can vary greatly. We can expect daytime temperatures of between 15-20C on a clear day with evening temperatures dropping to around 5C. There is a sleeper train involved, how comfortable is this? The train to Xian is a very comfortable and enjoyable experience. You will travel in a spacious 4-berth cabin which is clean and comfortable and you are also welcome to walk throughout the train to stretch your legs. Most Chinese people choose to travel by train and the cabins are the highest class available. The overnight train is a very nice way to see some more of the beautiful Chinese countryside, immerse yourself further into Chinese life and to unwind after a tough trek. Do I need travel insurance for the expedition? A visa is essential for travelling to China and must be obtained prior to travel. This can be done through the Chinese embassy and currently costs approximately £35. How many months do I need to have left on my passport? We recommend that you have at least 6 months remaining on your passport prior to travel to avoid any issues at international borders. Do I bring dollars or Yuan? It is possible to obtain Chinese Yuan in the UK but it may be necessary to give plenty of notice to your bank so they can order them for you. It is possible to change money at the airport in Beijing and also at the hotel. Generally it is easier to exchange dollars than sterling and small denominations are preferable. Note that US Dollars should only be taken to exchange – you WILL NOT be able to use it as general currency to pay for things. How much spending money should I bring – are there small shops on the trek or locals selling things as we go? There are some shops and markets along the trail that sell souvenirs and small gifts. You will also be able to buy soft and alcoholic drinks in the evenings. We would suggest that you bring £150-£200 spending money to cover tips, some small souvenirs and drinks. There are some fantastic shopping opportunities in Beijing so if you are likely to indulge in some retail therapy, more money may be required! Tipping – how much is considered standard for a tip to the local crew based on a group of 20 joining the trek. Should this be in dollars or Yuan? Yuan is better than dollars when it comes to tipping although both can be used. For an average sized group we would generally recommend $35-50 per person which will be split between all of the local Chinese team; guide, assistant guide, drivers and support. Will there be WIFI in the hotel top and tailing the trek? The hotel in Beijing will have internet access and many restaurants and bars in the city will also offer WIFI access. Out on the trail we are less likely to find WIFI although there are regular developments being made to these rural communities and the services at the accommodation are constantly improving. Will there be phone reception during the trek? There is generally a good mobile phone signal throughout this trek however 3G and 4G connections might not always be possible. There are sockets available at the accommodation each night that you can use to charge your electronic equipment. At the farmhouse there are fewer electrical outlets available so you will need to share with your fellow trekkers. China generally uses the “I” type (3 prong – also used in Australia & NZ) but most hotel outlets will also accommodate the “A” type from North America (2 prongs, no earth wire). I understand there is little English spoken – how do I communicate? Your local guide will be a native Chinese speaker with a very good command of the English language. He/she will be more than happy to teach you some basic Chinese words and phrases to help you communicate and to get more from your experience in China. Your guide will also be available to translate for you if there is something you need help with. We would also recommend buying a Chinese phrase book and doing some reading prior to arriving in China.